High coherence length. This is very typical to most gas lasers. In case of HeNe, the coherence length varies from 20 cm (for multiple longitudinal modes) to more than 100 m. It all depends on cavity parameters and mirrors and ethalons used in the design. Stable central wavelength. The typical emission wavelength of HeNe lasers is about 632.816 nm in air. Very stable oscillation frequency of <1 MHz (<0.001 pm @633 nm) drift is characteristic just to the most sophisticated HeNe lasers, having extra stabilization measures. The central wavelength of non-stabilized lasers can drift in the range of 1 pm, which is still fairly good, comparing to other laser types. High spectral purity. HeNe lasing medium features several emission peaks, however it is relatively easy to force the laser to oscillate in just one of the emission bands. Once it is done, no spontaneous emission or emission from other bands is detectable. Good beam quality and alignment. The longer is the gas tube, the easier it is to get good Gaussian beam profile, good beam quality and very good angular and spatial alignment with respect to the laser housing. Low-cost. Deep traditions of HeNe laser manufacturing and its wide spread in such applications as first barcode scanners and CD players has been driving the cost down and now a laser of 2-3 mW output power costs typically less than 1000 EUR. This is cheap, considering nice and useful characteristics described above. Short life-time. Helium atoms are very important for reducing the lasing threshold of the complete laser. But these atoms are small and tend to diffuse through the walls of the glass tube. Diffusion of He atoms is the main reason of short lifetime of HeNe lasers, which is often in the range of 1000 to 10000 hours, and that is less than 1 year of 24/7 operation. This is considered the main drawback of HeNe lasers in industrial applications. Long warm-up time. Manufacturers specify typical warm-up time of 10 minutes. 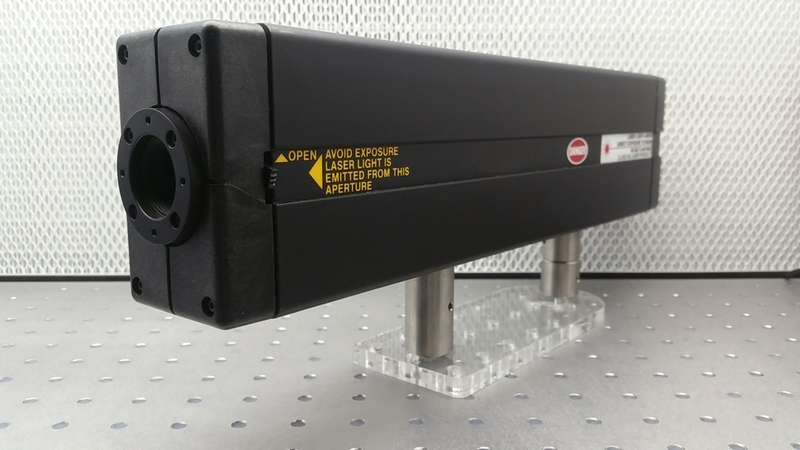 This might not be a big issue in some applications requiring continuous operation, however in situations where the laser has to be frequently turned on and off, this is a big drawback, which typically means that one has to install mechanical shutters, which open up for laser exposure, i.e. the laser mus run continuously, which further decreases life time. Low output power. 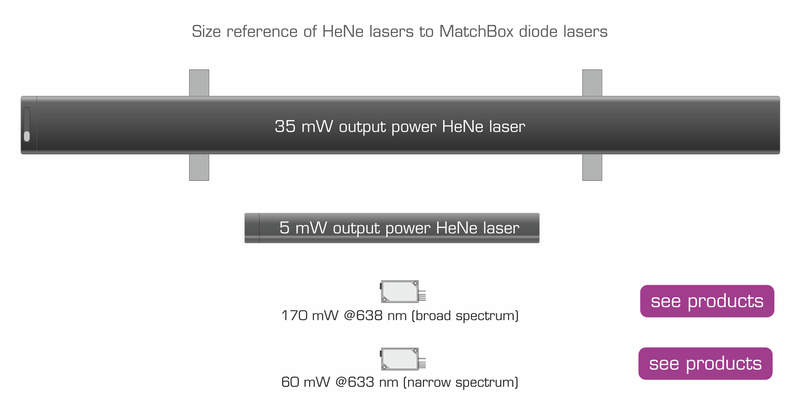 Most powerful HeNe lasers emit 35 to 50 mW of output power. This is low comparing with a 100 mW to 200 mW TEM00 output from some semiconductor lasers. Even frequency stabilized 633 nm lasers emit 70 mW to 100 mW of narrow-linewidth power. Very bulky. A 35 mW output power HeNe laser is about 1 meter long. It is not cost effective anymore to buy it, nor to store or transport it. Such big but not very powerful lasers are typically used in scientific labs or in some sophisticated holography applications. High voltage. HeNe lasers often use voltages above 1500 V. Such high voltages create certain risks for people and equipment around. What are the alternatives to HeNe? There are no widely known DPSS lasers that emit in the 633 nm range, however some time ago few manufacturers have developed and released to the market 633 nm semiconductor lasers. The output power from diode lasers are significantly lower at 633 nm (about 100 mW) than for example at 638 nm or 640 nm (up to 200 mW). But in the context of replacing HeNe lasers, 100 mW is two times more than the most powerful gas laser on the market. Talking about long lifetime, a 638 nm laser of nominal 200 mW can be driven at 1% power level to match a HeNe laser of 2 mW output power. 638 nm laser diodes have about 4 nm shift throughout this power difference, therefore at 2 mW output power the laser will radiate about 633-634 nm central wavelength, which very close. And the most amazing thing about that is that the life time of such laser diode will increase exponentially - from specified 5000 hours to theoretically >100000 hours. This is what get industrial laser integrators immediately interested. Despite of so many good intrinsic properties, HeNe lasers often do not meet the requirements of today's industrial environments. Industrial production lines with 24/7 operation are all about robustness and long lifetime, thus industrial instrument manufacturers tend to pay 2 to 4 times more for a laser, which has a longer life-time, is easier to replace and maintain. The price difference from HeNe lasers mainly depend on how many parameters of semiconductor lasers have to be close to the performance of HeNe. If one needs perfect beam quality, single-mode or polarization maintaining fiber has to be used to achieve <1.05 M2, nice round beam shape and diffraction limited divergence. Reasonably good central wavelength stability can by achieved by good temperature and power stabilization of the semiconductor emitter. Mos difficult and expensive to achieve is the long coherence length requirement. Most popular way of ensuring high coherence length and very stable (<5 pm) central wavelength is to apply external cavity designs (ECDL - external cavity diode laser) by using volume Bragg gratings or fiber Bragg gratings. Reality shows that it is hard or very expensive to beat the performance of good old HeNe, but laser integrators are willing to go into some compromises and this is happening in a really large scale - we can see traditional HeNe laser manufacturers stopping production. More and more semiconductor lasers appear on the market and successfully replace HeNe laser in many industrial application. It seems that in the future HeNe lasers will remain just as a reference in some calibration applications but we will not meet them in the Industry 4.0.